작가는 근현대의 정치사회적 상황들을 바라보는 입장에서 밀실행정이 실천되는 사례들(형무소, 교도소, 용산 참사 현장, 고 박종철 기념관, 옛 안기부건물 등)을 대상으로 ‘그리기-지우기’를 반복하며 자신만의 그리기 방식으로 번안하였다. 사루비아 공간 중심에 두 개의 시멘트벽을 실험적으로 가설하여, 회화적 주제가 지닌 장소성, 역사성, 공간성과 조우하며 밀실의 주제성을 부각시켰다. <실밀실 室密室 closed-door room>은 보이지 않는 밀실이 사회 ‘곳곳’에 있음을 암시하는 조어(造語)다.  우리사회에서 밀실이 통용되는 방식은 타인의 시선으로부터 배제된 일방적 소통을 하기 위한 공간이자 정치, 고문, 폭력, 죽음으로 이어지는 절차이기도 하다. 노충현은 이런 밀실이 정치의 영역을 넘어 일상의 영역에 존재하며 밀실화 되어가는 현실적 삶의 위기에 시선을 둔다. 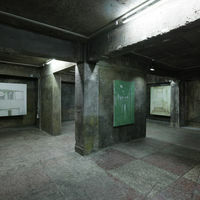 The artist adapted the places where its administration operates in secret rooms (prisons, Yongsan disaster site, Memorial of Jong Chul PARK, the old secret service building and etc.) 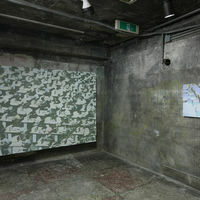 through his paintings with the focus on the socio-political situations of Korean modern history. In this series of works, he created his own way of painting by repeating &apos;painting-erasing&apos; gesture. 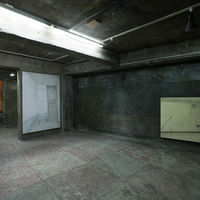 Two walls in cement temporarily built in the center of the gallery emphasized the theme of &apos;secret rooms- closed door room&apos; bringing out the strong characters of the place, history and space. 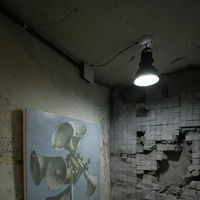 The exhibition title, is a coined word implying the fact that invisible closed rooms exist in every part of the society. In our society, the closed-door room is a place for one way communication away from the public and a pathway for politics, torture, violence and death. 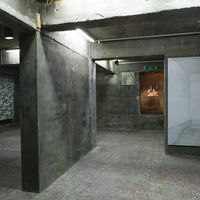 Choong Hyun ROH puts his concerns on today&apos;s crisis that this sort of closed-door rooms exist in our everyday life beyond the political territory and our life transforms into secret rooms.